Hello all! I’m so glad that warm weather is finally upon us and I’m thrilled to be spending more and more time outside. 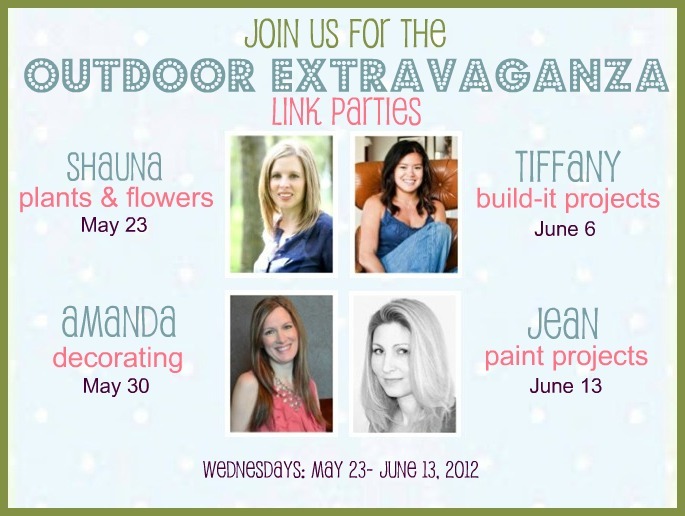 To celebrate outdoor living, my friends Amanda, Tiffany, Jean and I are all planning a round of outdoor link parties. Although it’s my first time hosting, I’ve taken part in many link parties since I started my blog. I’ve stumbled across amazing blogs and projects as a source of inspiration. As a bonus, many people have found their way to Satori and I’ve made many new blogger friends. We encourage you to join the party too! Be sure to mark your calendars- dates and themes are below. Remember it’s OUTDOOR PROJECTS, so start working on them now. We’re talking gardening, outdoor lounge areas, lanterns, fences and more. I have a few fun DIY and decorating ideas to share as well and I can’t wait! Ooh, can’t wait to read about everyone’s projects. I need some ideas for outdoor decorating and planting for sure!